I don’t dislike metadata at all. It does wonderful things to organize heaps of media, content. But it sometimes leaving me… cold. A tweet from Bryan Alexander got this mind clicking. These slides, now digitized, offer a critical glimpse into Bacon’s scholarly pursuits as well as the physical evolution of Philadelphia. Unfortunately, most of the slides he gave the library were not identified or labeled, making it difficult to determine who or what is in the picture. So we turn to the world with the hope that people can help us identify these images by tagging them, uploading related images, and offering remarks. Ahh crowdsourcing, it was the buzz of the internet quite some time ago. It still goes on, but seems to be less of a shine to the term. But my own experience, from unknown flowers to both a death valley image CD cover and a blues music cover art as the amazing things that happen when people add comments to flickr photos have always felt like a reliable candle in the dimming joy of the online world. But Bryan’s tweeted story got me thinking about something that happened a whole ago. I have been using the Library of Congress Free to Use Extension – it does this nifty thing in Chrome when I open a new tab. Rather than a blank space, it loads a random public domain image. Like 8 times out of ten it makes me curious, and sometimes I start paging through to find ones to use for blog posts. It’s a clever idea to spread public domain works. 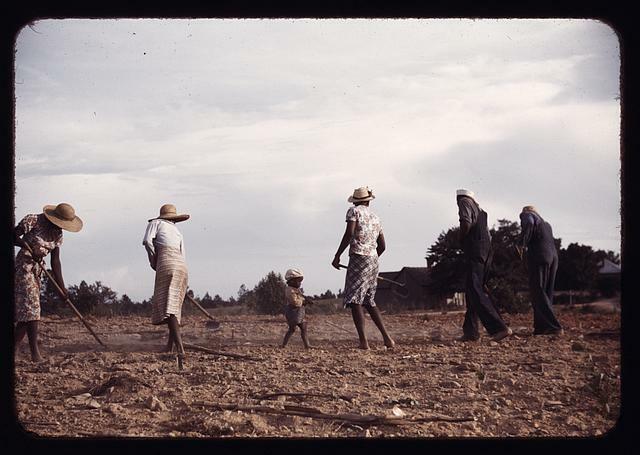 The record it leads to offers information about the photograph, it was taken by Jack Delano in 1941, it was a color slide, it was part of the Farm Security Administration – Office of War Information color slides and transparencies collection, a bunch of collection numbers. All very fine metadata. But who are the people? And that boy in the middle? Where is the story here? I had a hunch where to go, because there was also a link to the photo in the flickr Commons, where you find the same metadata… but much more in the comments. And these comments are 11 years old, older than most technologies that google has created and already shelved. Again, I don’t see any cotton plants being ‘saved’ or any weeds being ‘chopped’. Chopping cotton is a tillage practice. They’re cutting the stalks and then turning them under the soil surface. Usually people practice no-till farming these days. They look awefully dressed up to be in the field chopping cotton. Right you are. Nice clean dresses and spanking new overalls to work in the field? These folks are posed. haha you guys are dumb. people wore different things back in the 40’s, indeed, generally more formal than what we wear today. Not to work in a cotton field, haha. Compare what they’re wearing to a picture of people actually working. … on the other hand: why in the world should a photographer like Jack Delano be so naive to let people pose in their best clothes, if he wanted to show an authentic work-scene? By the way: make a query with the name “Jack Delano” throughout the commons and you’ll find some of the best photographs that this site has to offer. It’s messy. And sometimes off topic. But it’s human, and while I still do not know much more about the image, it feels closer than I got with cold metadata. I feel the breath of stories here in flickr comments, more so than most other places online these days where people supposedly “talk”. Give me metadata, ok, but also give me some storying too. 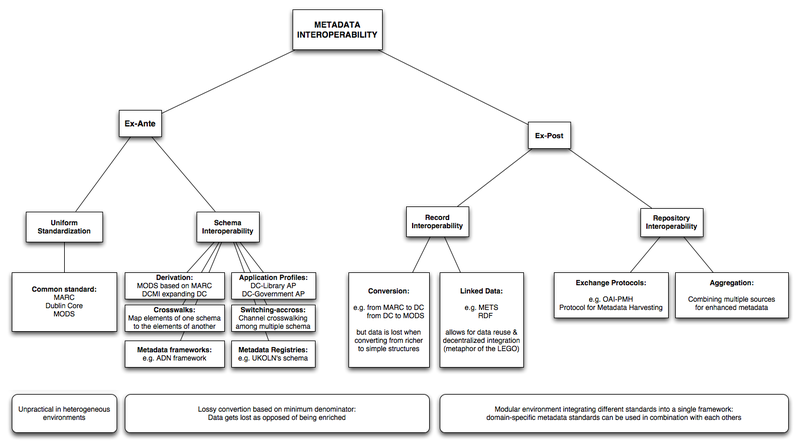 Featured Image: Metadata-interoperability.png Wikimedia Commons Image by Primaver shared under a Creative Commons CC BY-SA license.